It is only when the curtain goes up that the truth is told. With a working process as intuitive, unique, meticulous, and enigmatic as the resulting shows, it is a blind gamble to predict much about any Robert Wilson production, except its riveting genius. Aside from music steeped in Southern blues, traditional hymns and chants and zydeco, with less than three weeks out on the world premiere of Wilson’s “Zinnias – The Life of Clementine Hunter” at Peak Performances, January 26-February 3, only the facts of the show can be revealed with certainty. 2) An opera in one act, the show’s concept, direction, set and light are by Robert Wilson; the music and lyrics are by Bernice Johnson Reagon and Toshi Reagon. Jacqueline Woodson is responsible for the story and book. The costumes are designed by Carlos Soto; Scott Bolman is the assistant light designer; Jakob Oredsson is the assistant set designer; Lynsey Peisinger is the assistant director. 3) The performers are Cornelius Bethea, Nat Chandler, Carla Duren, Francesca Harper, Karma Mayet Johnson, Jennifer Nikki Kidwell, Josette Newsam-Marchak, Robert Osborne, Charles E.Wallace and Darynn Zimmer with Sheryl Sutton. The musicians are Robert Burke, Fred Cash, Juliette Jones, Jason Walker and Adam Widoff. 4) “Zinnias – The Life of Clementine Hunter” is produced by Peak Performances at Montclair State University. 5) The performance is one hour and a half with no intermission. The Alexander Kasser Theater at Montclair State University is located at 1 Normal Avenue, Montclair, New Jersey 07043. Tickets are $15, and are available at the box office, www.peakperfs.org, or by calling 973-655-5112. CLEMENTINE HUNTER is one of the most important self-taught American artists of the 20th century. She produced thousands of paintings drawn from her experiences working and living on a southern cotton plantation during the last century. Her works hang in the Smithsonian Institution, the American Folk Art Museum, the African-American Museum in Dallas, the Ogden Museum in New Orleans, the New Orleans Museum of Art, and numerous other museums and private collections. Hunter’s art will play a major role in the National Museum of African-American History and Culture, scheduled to open on the Mall in Washington, D.C. in 2015. Hunter was born Clémence Rubin in 1887 on Hidden Hill cotton plantation near Cloutierville, Louisiana. Her parents were sharecroppers in the fertile region that took its name from the oxbow lake known as Cane River. When Hunter was a teenager, her father gave up sharecropping to take a job that paid wages and moved his family to Melrose Plantation, one of the largest and most successful farms in the region. Hunter continued to live on or near Melrose for the rest of her life. At Melrose, Hunter toiled in the cotton “elds and pecan groves for most of her youth and then worked as a domestic servant in the plantation’s “Big House” when she approached middle age. Between 1917 and 1948, the plantation was owned and operated by Carmelite “Cammie” Garret Henry. Strongly infuenced by the Arts-and-Crafts Movement of the early 20th century, Henry developed Melrose into a haven for artists and writers, who were invited to live in the outbuildings and work for extended periods on the plantation grounds. life that was “over the fence and across the road.” Her paintings are recognized as visual narratives, telling the story of the African-American and Creole people who lived and worked on and around the plantation until their labor was replaced by mechanization after World War II. Hunter continued to paint until a few days before her death on January 1, 1988, at the age of 101. ROBERT WILSON was described by the New York Times as “a towering “gure in the world of experimental theater.” Wilson, born in 1941 in Waco Texas, is among the world’s foremost theater and visual artists. His works for the stage unconventionally integrate a wide variety of artistic media, including dance, movement, lighting, sculpture, music and text. His images are aesthetically striking and emotionally charged, and his productions have earned the acclaim of audiences and critics worldwide. Wilson’s awards and honors include two Guggenheim Fellowship awards (’71 and ’80), the nomination for the Pulitzer Prize in Drama (’86), the Golden Lion for sculpture from the Venice Biennale (’93), the Dorothy and Lillian Gish Prize for lifetime achievement (’96), the Premio Europa award from Taormina Arte (’97), election to the American Academy of Arts and Letters (’00), and Commandeur des arts et des lettres (’02), among others. BERNICE JOHNSON REAGON has been a major cultural voice for freedom and justice for more than a half-century. As artist, singer/composer/producer, as author, as a cultural historian with a specialty in the history of African-American culture; and as a teacher: in live solo presentations, in the classroom, as a museum curator, and in her documentary productions in radio, films and audio recording, Reagon has helped to shape the field of public history. Born in southwest Georgia, the third of eight children, her parents Rev Jesse and Beatrice Johnson grounded their family with a linked partnership of home, school and church. While in college during the early 1960s, Reagon’s activism as a student leader during the Albany civil rights movement resulted in her being jailed and expelled from school. Her singing power came to attention as a song leader in the Albany, Georgia mass meetings; she joined the first national tour of the SNCC Freedom Singers, organized by CordellH. Reagon. Completing her studies at Spelman College, with graduate work at Howard University, she formed the internationally renowned African-American women’s a cappella ensemble, Sweet Honey in the Rock. She led this group for 30 years until retirement in early 2004. She is curator emeritus at the Smithsonian National Museum of American History and professor emeritus of history at American University. Reagon’s work as a scholar, producer and score composer includes a number of documentary projects: Reagon was music consultant to the Emmy Award-winning series “Eyes on the Prize” (Blackside/PBS); “We Shall Overcome” (Ginger Productions), and conceptual producer and host for Peabody Award-winning radio series, “Wade in the Water: African American Sacred Music History” (National Public Radio and the Smithsonian Institution). Reagon composed the score for Peabody Award-winning “lm series on slavery: “Africans in America”(PBS/WGBH-TV), and is composer and librettist for Robert Wilson’s opera, “The Temptation of St. Anthony,” (2003 premiere in Germany). Reagon, with her daughter and strongest collaborator, composer/bandleader/ singer Toshi Reagon, and jazz pianist/composer Jeri Allen, composed the score for HBO’s Peabody Award-winning “lm “Beah: A Black Woman Speaks,” produced by Jonathan Demme and Lisa Gay Hamilton. Reagon’s pioneering work as a scholar, teacher, author and artist have been recognized with the Heinz Award for the Arts and Humanities (2003), the Leeway National Award for Women in the Arts (2000), the Presidential Medal for contribution to public understanding of the humanities (1995), the MacArthur Fellowship (1989), and the 2009 Howard University Distinguished Alumni Award in Humanities, Music, and Civil Rights. TOSHI REAGON is a talented, versatile singer, composer and musician with a profound ear for sonic Americana: from folk to funk, blues to rock. She masters each of these genres with vocal strategies that spiral and swoop from the expressively sinuous to the hard-charging with a combination of warmth and mischief. While her career has taken her to residence at Carnegie Hall and Madison Square Garden, she has also performed in music festivals, intimate venues and local clubs. She has worked with Lizz Wright, Ani DiFranco, Carl Hancock Rux, Nona Hendrix, Pete Seeger, Chocolate Genius and many other artists. She performs solo and with BIGLovely, her band of all-stars featuring Fred Cash, Robert Burke and Adam Widoff. Reagon has been the recipient of a NYFA award for Music Composition and !e Black Lily Music and Film Festival Award for Outstanding Performance. She is a National Women’s History Month Honoree, and the recipient of OutMusic’s Heritage Award (2010), and the Stonewall Honors Award (2012). JACQUELINE WOODSON is a three-time Newbery Honor-winner – in 2006 for “Show Way;” in 2008 for “Feathers;” and in 2009 for “After Tupac and D Foster.” “Hush” and “Locomotion” were both National Book Award “nalists. Woodson has been recognized by the Coretta Scott King Book Awards Committee for “I Hadn’t Meant to Tell You !is,” “From the Notebooks of Melanin Sun,” and “Locomotion,” all Coretta Scott King Honor Books. “From the Notebooks of Melanin Sun” and “I Hadn’t Meant to Tell You !is” both received Jane Addams Peace Award Honors, and Woodson’s highly-acclaimed novel “Miracle’s Boys” won the Coretta Scott King Award and the Los Angeles Times Book Prize and aired as a mini-series directed by Spike Lee, among others. Her workhas appeared on numerous Best Book and Notable lists. In 2006, Woodson became the youngest person ever to win the Margaret A. Edwards Award for Lifetime Achievement from the Young Adult Library Services Association. Her citation for that award states, “Woodson’s sensitive and lyrical books reveal and give voice to outsiders often invisible to mainstream America.” Her other lifetime achievement awards include the 2004 ALAN Award, the 2010 St. Katharine Drexel Award and the 2012 Anne V. Zarrow Award. In 2009, she adapted her award-winning novel, “Locomotion,” for the stage. The play was presented by the Performances for Young Audiences Family Theatre at the John F. Kennedy Center in Washington D.C. October 23 through November 4th 2010. 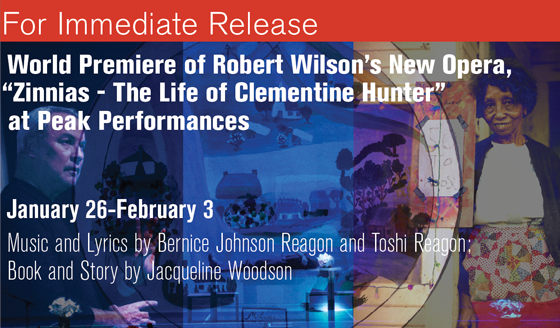 The World Premiere of “Zinnias - !e Life of Clementine Hunter” was produced by Peak Performances at Montclair State University in January 2013. “Zinnias - The Life of Clementine Hunter” is made possible in part by a grant from the Association of Performing Arts Presenters Creative Campus Innovations Grant Program, funded by the Doris Duke Charitable Foundation. Programs in this Peak Performances season are made possible in part by funds from the Association of Performing Arts Presenters; the National Endowment for the Arts; the New Jersey State Council on the Arts/Dept. of State, a partner agency of the National Endowment for the Arts; Discover Jersey Arts; New England Foundation for the Arts; Alison and James T. Cirenza; and !e Honorable Mary Mochary.